The oil is hygienically extracted through cold pressing and squeezing process from black cumin seeds and kaluanji (black cumin) oil. This oil has high nutritional value as it is enriched with essential oils and fatty acids like carvone, sabinene, beta-pinene, stearic acid, linoleic acid, arachidic acid, palmitoleic acid, myristic acid, oleic acid and various other chemical compounds. 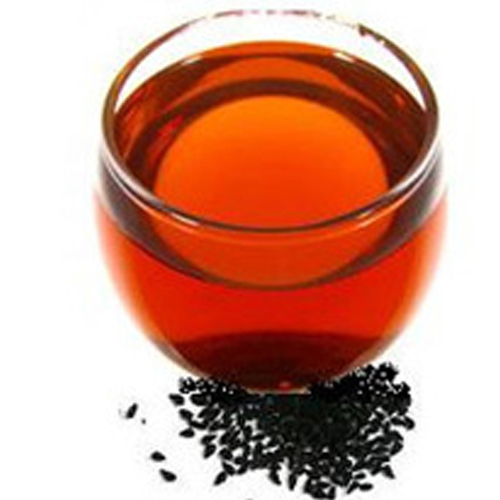 Black Seed Oil is enriched with unique aroma & nutrients and is a major source of iron, calcium, potassium and sodium, which are required for the proper functioning of the body. It has extensive medicinal value and is ideally used as remedy for various health issues like colic, diarrhea, constipation, dysentery, cough, swine flu, bronchitis, asthma and allergies. The oil is also effective in reducing cholesterol level, blood pressure and treating cancer. This oil comprises of the properties like Anti-spasmodic, bronchodilating, anti-allergic, anti-bacterial, aromatic, anti-inflammatory, analgesic and anti-oxidant. The oil plays a vital role in the treatment of different health issues including diabetes, diarrhea, cystic fibrosis, cough, asthma, flu, nasal congestion, impaired vision, facial paralysis, bronchial, hypertension, constriction of veins, skin diseases and nervous system disorder. This oil is also effective for increasing the flow of breast milk and for improvising the growth of infants. The oil is used as a flavoring agent while preparing different cuisines and desserts. Black Seed Oil (Black Cumin Seed Oil) comprises of essential oils, fatty acids and other nutrients, which make it ideal for therapy in long-standing treatment processes. With its properties like anti-allergic and anti-bacterial, the oil is good for therapies. This oil is also superior for cancer therapies. Any prescribed medicine should not be replaced by black seed oil without acknowledgment of physician.